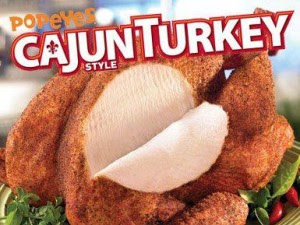 Coming off of National Fast Food Day (lol) and going into my favorite holiday - Thanksgiving - I felt like now would be the best time to put some of my slower readers on to something you should have been a LONG time ago - Popeyes' Cajun Fried Turkey!!! They've been offering this for quite some time but if you haven't had it, you're missing out!!! It's a whole turkey that been prepared with many of the spices that they use for their original recipe chicken plus some cool extras. No, it does not come out crispy and golden like their 2pc meal. However, the taste is second to none. I had their fried turkey for the first time like 5 years ago and I've been championing it ever since. Now, I will tell you that I found the Cajun Fried Turkey recipe online. But, come on. Why would you make it yourself when you could just buy and save yourself all the time and hassle. Thanksgiving is for EATING!!! Who cares how it got there?? Just FYI, it is NOT deep fried or even flash fried. This is from an official response from corporate headquarters.